SASCO America offers monthly breakbulk service from Philadelpia and Houston to Vladivostok Fish Port and Korsakov. 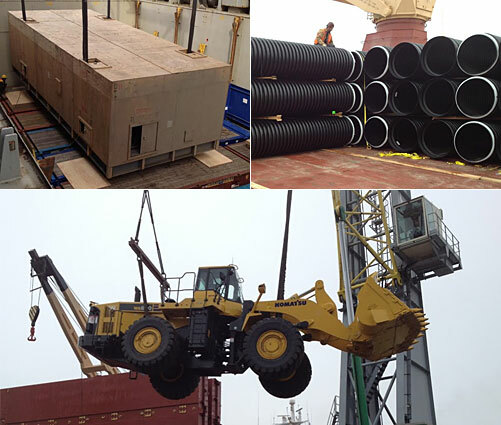 Our partner carrier for breakbulk is Chipolbrok. With a direct service to Busan this is an excellent connection. From Busan we arrange oncarriage to Vladivostok Fish Port and Korsakov. To compliment the breakbulk service we offer weekly flatrack service to Busan and breakbulk oncarriage to Korsakov and Vladivostok Fish Port. This combination offers very competitive rates coupled with fast and frequent transit times. Magadan is served via Vladivostok. Inland service is offered from all major US Ports and can include lashing and securing in New York, Savannah, Los Angeles, Houston and Tacoma/Seattle.